Honey, grab the kids: we're going abroad. Much of the world is on sale for Americans right now since the U.S. dollar is enjoying one of the strongest moments in modern history. Just about everything from hotels to luxury handbags to McDonald's hamburgers is cheaper abroad than in the United States right now. When you take dollars to the foreign exchange booth, you get a lot more of another country's currency back than you used to. If you were dreaming of a vacation to a far off destination, now is the time. While Europe may be the first destination to spring to many minds, Americans can get more bang for their buck across many other countries across the globe. 1. That European trip you always wanted. If you're dreaming of Paris, that's a steal right now. 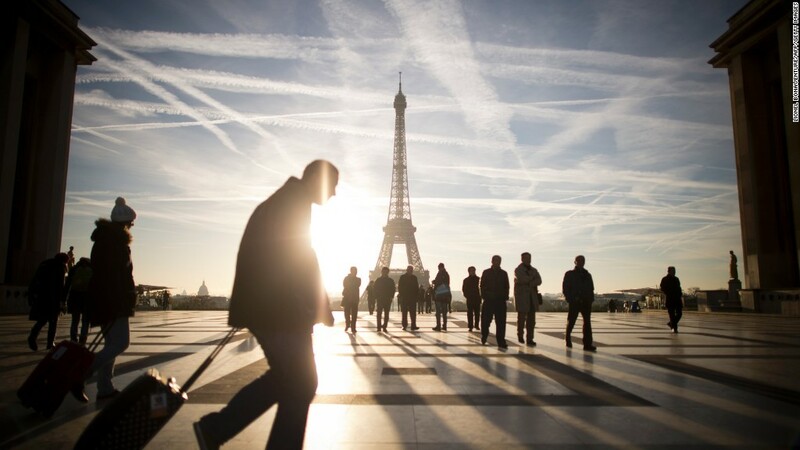 Recent roundtrip flights to Paris are as cheap as $519, according to Hopper, a travel-data site. Travelers have noticed the deals. Flight searches for New York to Paris are up nearly 10% last week compared to prior four weeks. The reason is simple: the euro is now nearly equal with the dollar. One euro costs $1.09. Compare that to a year ago when one euro was about $1.40. (Here's more on why Europe is so cheap). Travel to the euro area -- Germany, France, Italy, Spain, Portugal, Belgium and Austria, among other nations -- is almost 20% cheaper now from a year ago. The European economy is struggling, causing more bargains and discounts. Hotel reservations are up in Italy, Spain, and Germany, according to Priceline (PCLN). Outside the euro zone, Norway is another good bet: the dollar has appreciated by a third over the past year. That's a lot better than usual, since Scandinavia is typically viewed as one of the more expensive places to visit. 2. Calling all Russian Vodka fans. Moscow is a can't-miss for cold-weather travelers right now. Russia's ruble has been tanking as its economy gets hurt by western sanctions and plunging oil prices. One dollar would get you 35 roubles a year ago. Now a dollar gets you 57 roubles. Of course, this isn't just a currency problem. The conflict between Ukraine and Russia has scared travelers away. The tourism industry is trying to rebound by offering deep discounts. 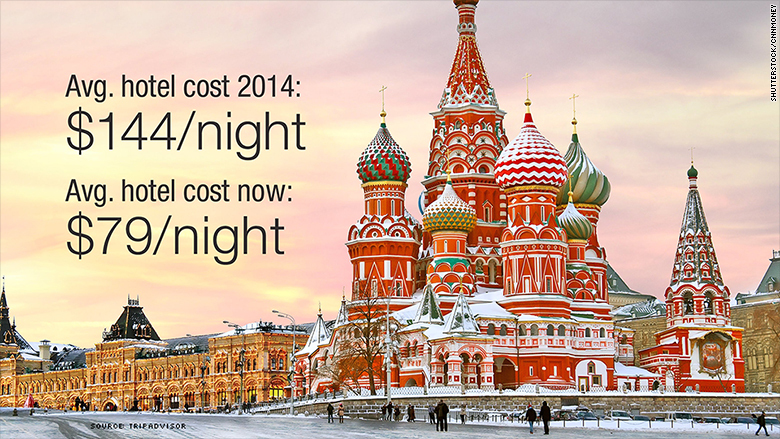 Flight prices from New York to Moscow have dropped 37% on the year and hotels are 45% cheaper than a year ago, according to Hopper and TripAdvisor. If you'd rather see the sun than sip on Stolichnaya vodka, the U.S. dollar can save you money on the other side of the equator too. 3. Brazil is a bargain. Pack your bikini, speedo and SPF 30: it's the right time to go to Rio de Janiero -- or anywhere else in Brazil. Brazil's currency, the Real, has lost almost 30% of its value against the dollar from a year ago. That means places like Rio and Sao Paulo are much cheaper to visit now. A typical flight from New York to Rio was $1,170 last March. Now it's $856, according to Hopper, which points out that flights have gone down since the World Cup last summer. Hotels in Brazil are 12% cheaper compared to a year ago, TripAdvisor (TRIP)data shows. By the way, you want to go now before prices possibly soar again for the Summer Olympics in 2016. Brazil economy is also getting hurt by inflation and the end of a long commodity boom. Add on a strong dollar and you've got a recipe for Americans to B-line it to Brazil this year. But if you want to practice Spanish instead of Portuguese, there's another steal down South. 4. Colombia is calling. Colombia is one of the South America's best growth stories right now, but the U.S. dollar's rally keeps the trip cheap. The dollar has gained 18% in value on the peso in the past year. Hotels in Colombia are 10% cheaper from a year ago, according to TripAdvisor. Flights are bit cheaper too, Hopper reports. While many Americans still think of Colombia as the "murder capital," that image is outdated. The country is booming. The capital of Bogota and Medellin, Colombia's second largest city, are becoming tech and cultural hubs while Colombia's beaches are beautiful. The coffee is outrageously good and cheap too. 5. The South African Safari. The famous ocean views in Cape Town look even better now: It's 13% cheaper for folks with dollars to vacation in South Africa. Similar to Brazil, South Africa's currency is losing value against the dollar as commodity prices slump. Flights from New York to Cape Town are down 24% from a year ago, according to Hopper. To put it another way: South Africa is more than double distance to New York than Paris, yet flights there cost a mere $130 more. If you don't mind really long flights, South Africa offers a lot of bang for your buck. How long will these deals last? At the moment, experts predict the U.S. dollar is likely to stay strong through the end of the year, but it's unclear whether travel will pick up enough to lift flight and hotel prices even sooner. The word is getting out.